It’s been an up-and-down journey thus far for Houston Rockets fans this off-season. UP: The Rockets pulled in a nice haul in the 2015 NBA Draft, nabbing Wisconsin small forward Sam Dekker with the #18 pick and stealing Louisville power forward Montrezl Harrell with the #32 pick. Mock drafts had Dekker going as high as #8 and rarely lower than #15; and most mocks had Harrell as a sure-fire first round pick. UP: Early in the July Moratorium, the Rockets agreed to terms on new deals with Corey Brewer (three years, $23.4 million) and Patrick Beverley (four years, $23 million). Both signed contracts that decline in salary each year. Brewer’s starting salary is the maximum amount Houston could sign him to with Early Bird rights; and his total contract pays him the exact same amount as Trevor Ariza over the next three years. The fourth year of Beverley’s deal (at just over $5 million) is fully non-guaranteed. Given the contracts that have been handed out this summer, both deals were largely viewed as reasonably good value. DOWN: On July 4, the league’s premier (departing) free agent, LaMarcus Aldridge, announced that he was joining the San Antonio Spurs, shunning the Rockets’ bid for him. A key reason for the speedy agreements with Brewer and especially Beverley (a restricted free agent) was to prove to Aldridge that Houston would be fielding a competitive roster. It is believed that the Rockets were attempting to acquire Aldridge via sign-and-trade using a package centered around Jason Terry (to be signed-and-traded via his Bird rights), Kostas Papanikolaou (and his non-guaranteed contract) and young players and/or draft picks. UP: The Rockets added veteran shooting guard Marcus Thornton on a one-year veteran’s minimum deal. While not much of a defender, Thornton is expected to provide much-needed three-point shooting to a team that utilizes the three-point shot more than any other team. He is also capable of the occasional scoring outburst. DOWN: Seeking a more defined role in advance of hitting free agency again in 2016 (and probably also a little miffed that the Rockets were not willing to use their MLE on him), Josh Smith bolted Houston for the Los Angeles Clippers after endearing himself to Rockets fans during the team’s recent playoff run. UP: The Rockets agreed to a new deal with restricted free agent K.J. McDaniels (three years, $10 million, using a portion of the MLE). The McDaniels contract includes a team option in Year 3; and by virtue of signing him outright (rather than waiting to match an offer sheet he could have signed elsewhere), the Rockets can trade him without restriction after December 15. DOWN: Several hours went by following news of the McDaniels signing without the Rockets making another roster move, leaving many fans to be moderately bored for a short period of time. But Houston’s most notable off-season move came later that evening. 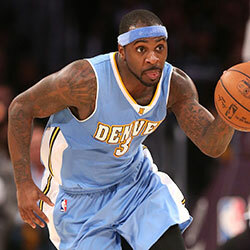 UP: Houston pulled off a major trade, acquiring Nuggets star point guard Ty Lawson and a 2017 second round pick in exchange for Papanikolaou, Pablo Prigioni, Joey Dorsey, Nick Johnson, and a lottery-protected 2016 first round pick. In order to make the salaries match in this trade, the Rockets had to renounce their rights to Terry, whose $8.7 million cap hold came off the books, allowing Houston to take back over 150% of its outgoing salary, which is reserved only for teams whose total team salary (including players’ cap holds) does not exceed the luxury tax threshold upon completion of the trade. The downside risk of acquiring Lawson — who not long ago was arrested for his second DUI this year — was mitigated by several factors. 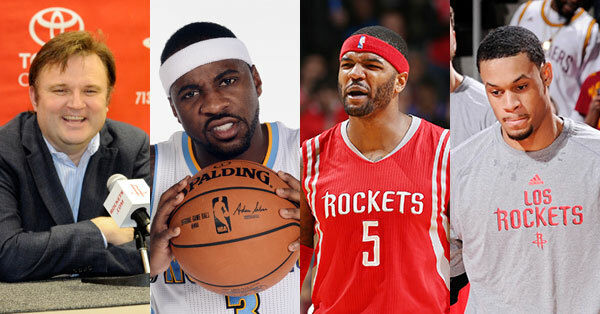 None of the players traded to Denver were in the Rockets’ rotation. The 2016 first rounder immediately converts to a 2017 second rounder (via Portland) if the Rockets somehow miss the playoffs this season. 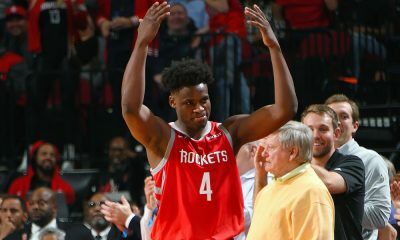 But most notably, Lawson agreed to make the final year of his contract (for over $13.2 million) fully non-guaranteed, essentially making it like a team option for Houston (although, unlike with a “real” team option, the Rockets would not have any Bird rights to Lawson next summer if they waived him). At worst, the Rockets will have wasted a draft pick and some money on a troubled point guard. At best, Lawson can be that second ball-handler and shot creator the Rockets desperately missed in their recent playoff run. With those ups and downs out of the way (and with more sure to come), it’s time to once again take a look at the team’s salary cap situation and where the Rockets can go from here. 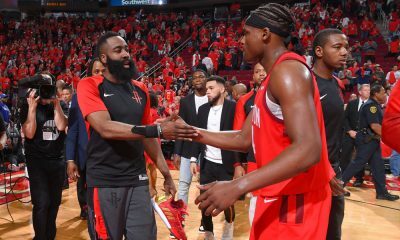 Player salary commitments: Dwight Howard ($22.36 million), James Harden ($15.76 million), Lawson (12.4 million), Brewer ($8.23 million), Ariza ($8.19 million), Beverley ($6.49 million), McDaniels ($3.19 million), Terrence Jones ($2.49 million), Donatas Motiejunas ($2.29 million), Dekker ($1.65 million), Clint Capela ($1.24 million) and Thornton ($947,276). Other Salary Cap Exceptions: Houston has some small trade exceptions from the Alexey Shved ($1.62 million), Isaiah Canaan ($816,482) and Troy Daniels ($816,482) trades. The Rockets used a portion of the MLE — which can be either the Non-Taxpayer MLE ($5.464 million) or the Taxpayer MLE ($3.376 million) — on McDaniels. If Houston elects to use the Non-Taxpayer MLE (of which they will have about $2.27 million remaining) this season, it will be subject to a hard cap at the “apron” level of $88.74 million. The maximum team salary (or “soft” salary cap) for 2015-16 came in at $70 million, with the luxury tax threshold coming it at $84.74 million, both numbers a little higher than projected. However, based on their existing salary commitments (totaling over $85.2 million thus far), the Houston Rockets are officially over the luxury tax threshold. With the Rockets already in tax territory, they need to be very careful about their next moves; but with only 12 players under contract, they still need to add to their roster in advance of training camp in a couple of months. There are also reports that the Rockets have extended a contract offer to Terry, presumably also a one-year veteran’s minimum deal. While Terry may still be negotiating for a second year on his deal, that concession could be costly to the Rockets, both this season and next. Terry’s minimum salary (like Hayes) is nearly $1.5 million this year; however, for two-year minimum deals, the team is on the hook for the player’s full salary (and the cap hit would match that salary). Signing a two-year deal with Terry would cost the Rockets an extra $1.38 million this season in salary and luxury tax than what they’d pay for a one-year deal, let alone the salary commitment for 2016-17. Shortly after the draft, it was reported that the Rockets had reached an agreement to sign undrafted free agent Christian Wood to a contract. Presumably, it is a two-year minimum deal with a partial guarantee. 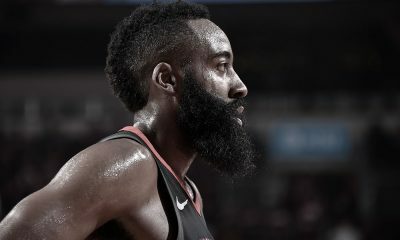 Although his rookie minimum salary would be $525,093, for purposes of determining whether the Rockets are over the luxury tax threshold or the apron level, his cap figure will be the two-year veteran’s minimum salary ($947,276). Because the Rockets are over the luxury tax threshold, each veteran’s minimum signing will cost owner Les Alexander at least an extra $1.42 million in luxury tax (or more, if an older vet is signed to a two-year deal), on top of the player’s actual salary. Montrezl Harrell is worth a portion of the MLE, but at what cost to the Rockets’ cap flexibility? 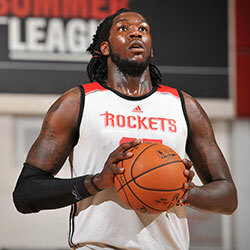 Probably the most intriguing roster move may relate to what the Rockets do with Harrell. As a high second round pick, Houston ideally would like to sign him to a three- or four-year deal paying above the minimum salary using the MLE. Some players drafted shortly after Harrell have received some relatively sizable contracts, such as #33 pick Jordan Mickey (four years, $5 million, presumably with over $3 million guaranteed) and #36 pick Rakeem Christmas (four years, $4.3 million, with $3.15 million guaranteed). Unfortunately, while Houston still has more than enough remaining of the Non-Taxpayer MLE to give Harrell a similar deal, the Rockets are dangerously close to the apron level, where they would be hard-capped if that MLE were used. Assuming that Terry, Hayes and Wood are all added on minimum deals, the Rockets would only have enough space to pay Harrell about $665,000 in Year 1 of an MLE deal without salary being cut elsewhere. This would also limit the Rockets’ ability to add any more salary, even for 10-day contracts and other minimum salary signings. The hard cap is truly a HARD cap. For these reasons, it seems that the likeliest course of action (barring a trade involving Harrell or otherwise freeing up a meaningful amount of salary) would be to sign Harrell to a one- or two-year rookie minimum deal. However, Harrell does not have to accept a two-year minimum deal if he does not want to. He could instead opt to accept a one-year non-guaranteed contract for the rookie minimum — the required minimum tender for the Rockets to retain his NBA rights — and become a restricted free agent next summer. This was the same strategy used by McDaniels last year with the Philadelphia 76ers, and that strategy clearly paid off for K.J. this summer. But McDaniels had the benefit of assured playing time on a horrendous Sixers team, whereas Harrell will likely be relegated to the D-League for most of this season, with no assurances of NBA playing time on a talent-laden Rockets roster. With Harrell not being signed to an MLE deal, the Rockets would be free to sign as many minimum contracts as they wish in order to fill out their training camp roster and would be free to make trades taking back additional salary (although they will likely be limited to the 125% matching rules for taxpaying teams). Of course, any additional salary would still be subject to payment of the luxury tax. 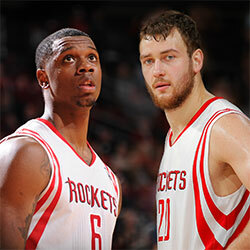 Another key issue on the table for the Rockets this off-season: whether or not to extend the contracts of Jones and/or Motiejunas. Each is eligible for an extension of their rookie contracts, which can be up to four (new) years in length and at up to the maximum salary (based on the new increased salary cap), although odds are that each would get less than that on an extension. As Bobby Marks wrote about recently, Jones and Motiejunas could be two of the most highly coveted free agents next summer. With the vast majority of teams expected to have copious amounts of cap room, and with the league mandating a minimum team salary at 90% of the new salary cap, teams will be spending like drunken sailors, out of both desire and sheer necessity. 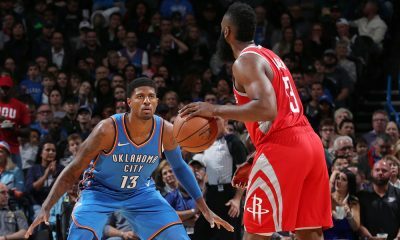 But even with the imminent threat of them being poached in free agency next summer, it is not expected that the Rockets will take the extension route with either player. If allowed to hit free agency, each would have a much lower cap hold than what he would likely get on an extension or in free agency ($6.22 million for Jones; $5.72 million for Motiejunas). Having those lower cap holds gives the Rockets greater flexibility if they want to pursue another star free agent, such as Kevin Durant in 2016, or other avenues for roster improvement. The Spurs recently used this strategy (electing not to sign Kawhi Leonard to an extension last summer) in order to gain the cap flexibility to sign Aldridge this summer. 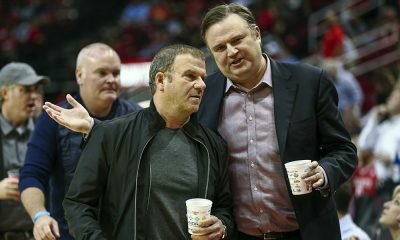 Don’t be surprised if the Rockets explore trade scenarios for at least one of Jones or Motiejunas, perhaps for a future draft pick or a power forward with more years remaining on his contract. It is unlikely that Houston can afford (or is otherwise inclined) to re-sign both to large new contracts when both play the same position. On the other hand, the Rockets may just as well be inclined to let both play out the year and go with whichever player best distinguishes himself. Or hell, they could re-sign both. There are options galore on that front. It has been a pretty wild off-season thus far for the Houston Rockets. With the addition of Lawson, they are positioned as a top title contender this season. While the likely inability to lock up Harrell on a longer-term deal is not ideal, it is a small price to pay for avoiding a hard cap and being able to add to the roster and to make in-season moves. And with a roster lined with veterans on reasonable contracts and first round picks on rookie scale deals, the Rockets have plenty of flexibility going forward, whether via trade, free agency or otherwise.